In this blog post I highlight problems in Wellington, New Zealand. Please don't turn away just because you don't live in Wellington because many cities across the world have exactly the same struggles to cope with the volumes of traffic. 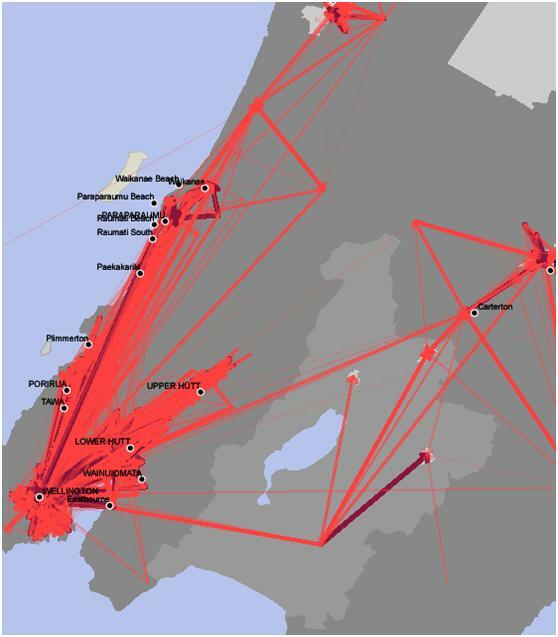 You may well recognise the problems that Wellington faced and is facing as being similar to those of your own city. 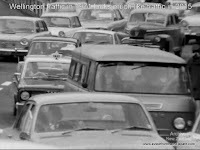 A few days ago I came across a very interesting 44 year old film about the problems caused by mass motoring. Participants in the film talked about planning to avoid future problems. 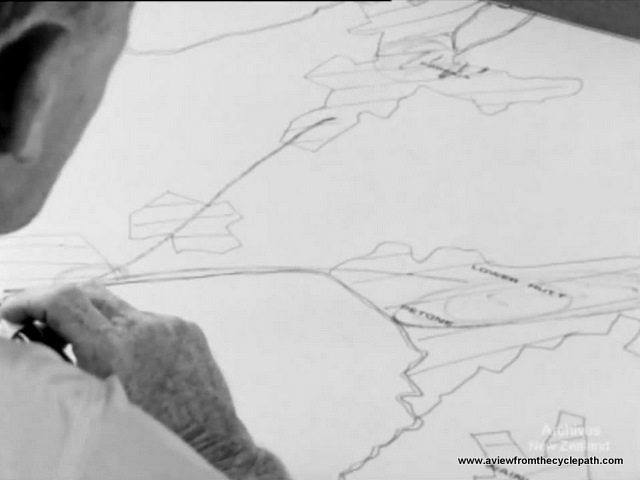 The film was made in Wellington, New Zealand so this blog post is in large part about Wellington. But actually, the film could have been made almost anywhere because the problems which it presents and the suggested solutions are common to almost anywhere. This film could even have been made in a Dutch city at that time as Dutch cities faced very similar problems. First of all, if you really need to see it, here's a link to a video of horrific traffic around Wellington. It's what many cities around the world look like now. Traffic jam in 1971. What's changed ? One of the comments under the original posting of that youtube video said "40 plus years on we still have the same unresolved problems...", and of course that is the result of following a path which won't create change and lack of progress is a problem common to many cities across the world. What makes the film particularly interesting to me is that it doesn't only show the problems, but that expert and sensible people have thought about the problems and make suggestions of ways to try to resolve some of them. However what absolutely no-one in the video ever does is suggest that non-motorized transport in the form of bicycles could be any part at all of the solution. I suspect that many Wellingtonians believe, just like people all across the world, that their city is not one in which bicycles could be practical. 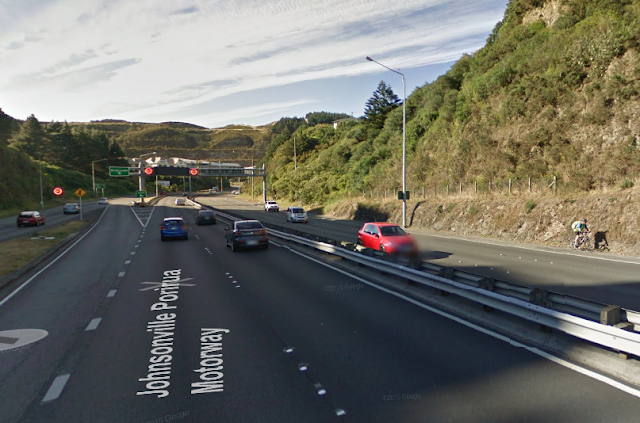 There will be people who think that Wellington's hills, wind and rain make cycling impractical. These are common myths. However cycling in Wellington most certainly is possible for average people for at least some of their journeys and the film provides evidence that this is true: While no-one ever talks about bicycles in this film, and the focus of the film is certainly not to demonstrate that cycling is possible in Wellington, the film-makers couldn't help but include bicycles ridden by Wellingtonians in their film. 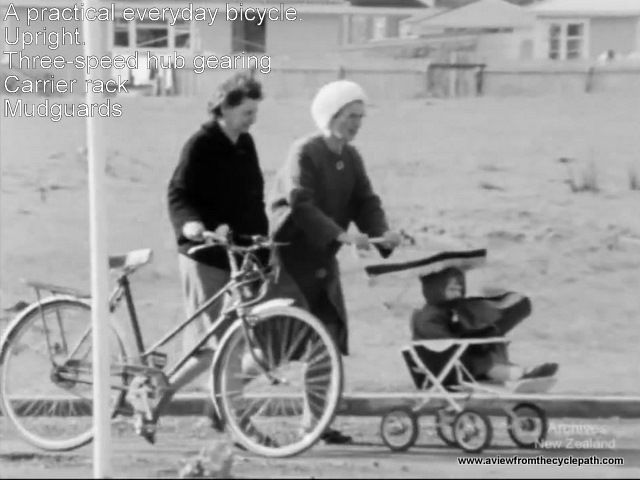 People rode practical everyday bicycles in Wellington in 1971. An upright position, three speed hub gearing, mudguards, carrier... This is almost identical to the type of bicycle which is now ridden for most journeys in the Netherlands. It was suitable for Wellington in the early 1970s and it would be just as suitable now, if only there were safe places to cycle. 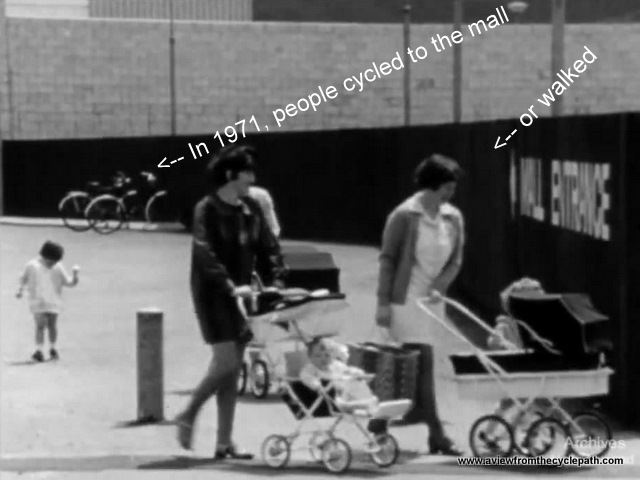 The people who we see cycling in Wellington in 1971 are not sport cyclists. They are going about their everyday life using a bicycle as a practical way of getting about. These bicycles are suitable for socializing, for shopping trips, for going to work, for going to school, for carrying children. 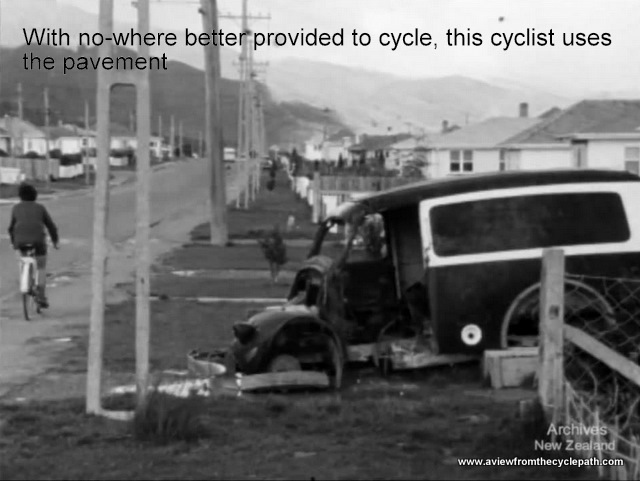 Some politicians in New Zealand may not remember that cycling was once relatively normal, but I do. 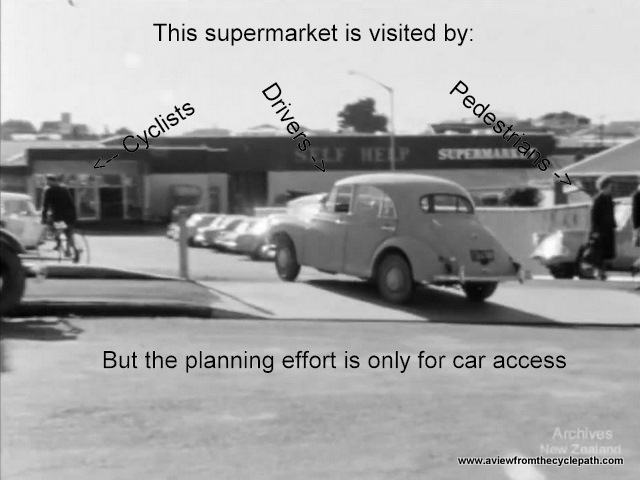 This shot of a supermarket showed cyclists, pedestrians and drivers as visiting for their shopping. Of course, if you plan only for motor vehicles, motor vehicles are what you will end up with. When the camera showed busy roads like this, hostile to cycling, no bicycles were caught on film. Most people were already excluded by design because this is far too hostile an environment to encourage people to cycle. The same story has been repeated across the world: As roads become busier, most people will cycle less or stop cycling altogether. An aspirational picture of a new suburb includes a bicycle, but it is not spoken about. In a real suburb of Wellington there is no comfortable cycling infrastructure. This leads to cyclists being under pressure. Cycling on the pavement is a symptom of that pressure. Pedestrianization: Streets which once accommodated all traffic are transformed so that they don't accommodate any. This can result in making good conditions for people who visit by motor vehicle and use the supplied car parking, at the expense of making the destination awkward to use for those who cycle. 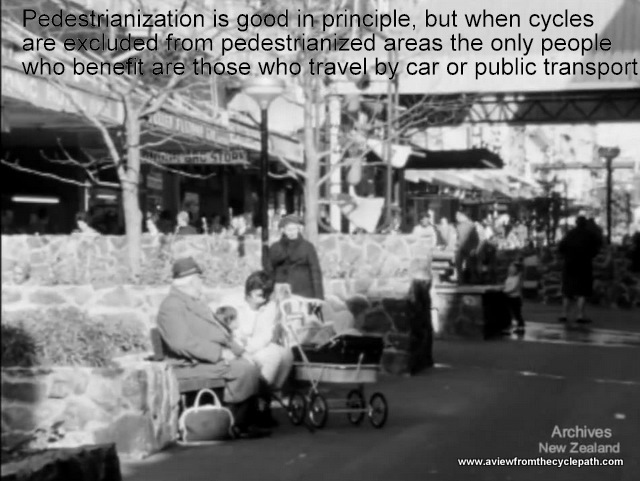 Pedestrianized areas can be designed to allow and encourage cycling. 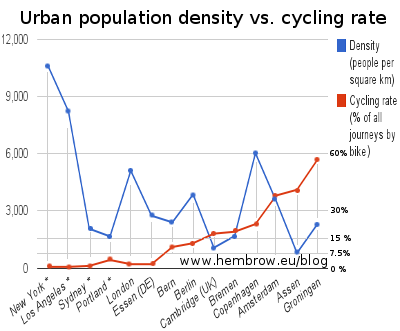 Zealanders too cycled more than the Dutch do now. 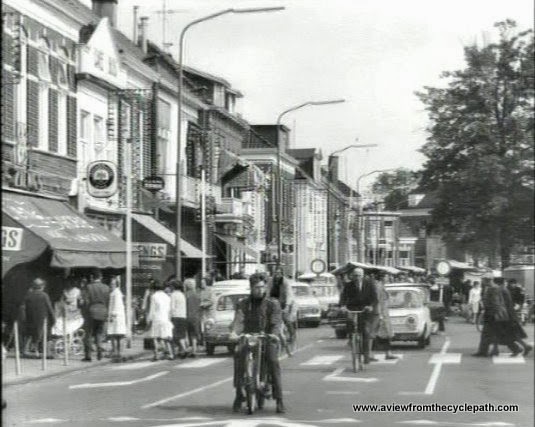 In the photos above you'll see evidence that into the 1970s, New Zealanders still used the same practical everyday bicycles as are seen in the Netherlands these days. You'll also see some of the factors which were already putting pressure on cycling and which eventually would lead to it being something which only hardened "cyclists" would be involved with. Cycling was once a popular means of transport in New Zealand: "Cycling became a popular mode of transport in many parts of New Zealand for half a century," but "in the 1950s and 60s government transport funding and policies favouring motor vehicles as the transport of the future". The same decline was seen worldwide, including here in the Netherlands. It is only by similar government action to that which made cycling decline that cycling can be made attractive once again. 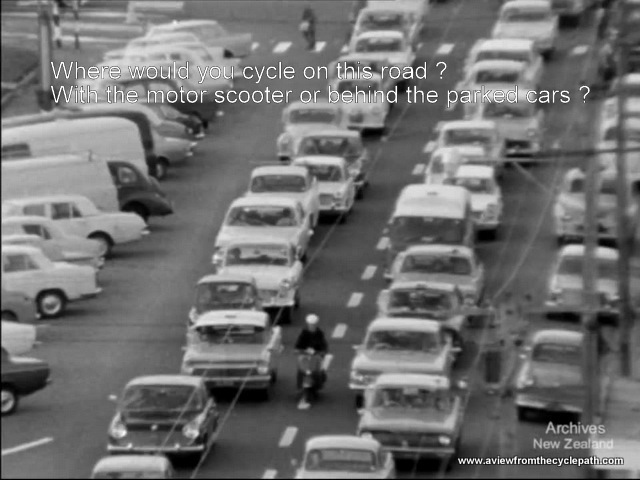 Unfortunately, cycling was not valued sufficiently in 1971 even to be mentioned by planners in the film. There is an interesting quote at the beginning of the film: "It is an indication of the influence of the motor vehicle, that it makes us take stock of things, even to the extent of asking what sort of lives we want to lead." A choice needed to be made. 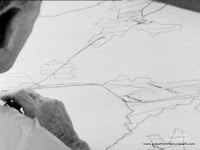 The film-maker realised that many futures could be planned depending on how people wanted to live. While the problems caused by mass motoring were already highly visible 44 years ago, a choice was made in most places to continue to favour the motor vehicle. That has not changed over the last four decades, and the problems caused by making that choice are still evident. Keep planning for more cars and more cars is what you will get. In the 1970s, the same policies were being followed everywhere. The Netherlands is no exception. The photos below from Assen in the Netherlands in the 1970s are very similar to the photos of Wellington. But the photos of Assen now look different because a different decision was made a little later and the damage was turned around. The result is that the city centre has been transformed so that even small children can ride their bicycles in from the suburbs and enjoy a great degree of freedom when they arrive. 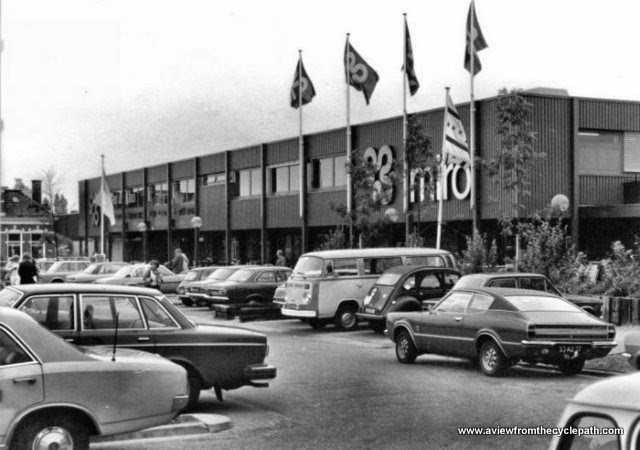 A supermarket in the Dutch city of Assen in the 1970s. The car-park is more than full, conditions for cycling were not particularly pleasant. The new supermarket on the same site as above provides excellent access by bike. This shopping centre has cycle-paths at one end and other well designed infrastructure at the other end providing safe routes to both doors. Bicycles can be taken inside and parked right next to the shops. Car parking is free of charge for shoppers but cycling is the most popular way of visiting the supermarket. Read more about this location's transformation. Dutch city centre street in the 1970s. No space was allocated for comfortable cycling and pedestrians had little space. The same location in 2014. We don't need traffic lights any more because cars are no longer driven through here. Note how there is ample space for cyclists on a "road" for bikes separate from a wide pedestrian path, and that the pedestrian path has plenty of space on both sides for a textured surface for blind pedestrians. More about this street and others. 1970s Assen street. Cyclist in the middle of the road waiting for a second transport revolution. Nowadays, the same junction looks like this. It's busy with bikes, not so many cars. The result of deliberate policy to improve city centres. Note the empty car parking bays. There aren't many provided but they're rarely full. Read more about this street and watch a video about the transformation. Assen early 1970s: This tunnel still exists and I use it every day. 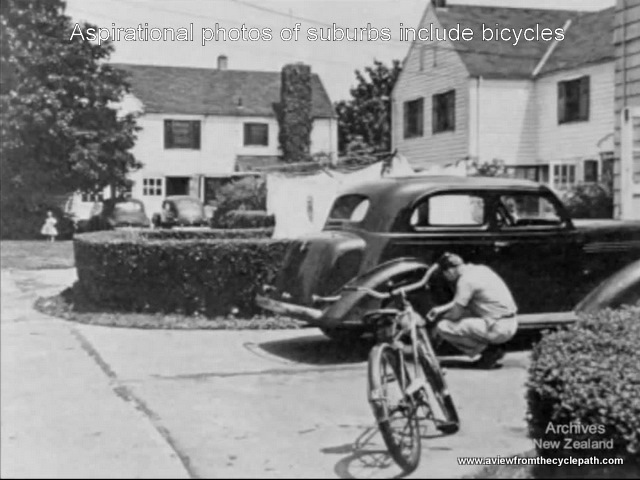 An aspiration was shown even as early as this to encourage bikes and in the picture shows the result in this location. This cyclist is entering what was then a newly built suburb using a tunnel which avoids cyclists having to use a large traffic light junction. It still exists and is very useful today. Note how this cyclist looks just like those in the old film from Wellington, riding the same kind of practical everyday bike. 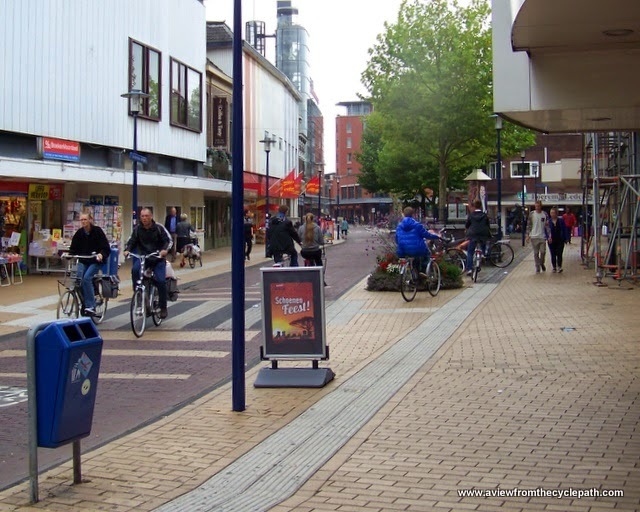 In the Netherlands, those bikes never went away and normal people who didn't identify as "cyclists" continued riding them because when the error was realised, cars were not allowed to totally dominate. But there's one important difference. This new suburb, built between 1970 and 1975 and very much part of the solution to the problem, was planned like most Dutch suburbs. i.e. pleasant to live in, low-rise and very spread out with a lot of green spaces when compared with the high density type of housing under consideration by participants in the Wellington film. (source, licence: wikipedia) Wikipedia has a good page about Wellington. The city has a population of just under 400000 people. Property market speculation pushed up prices so that city centre living is expensive, the result being that "The typical central city apartment dweller was a New Zealand native aged 24 to 35 with a professional job in the downtown area, with household income higher than surrounding areas. Three quarters (73%) walked to work or university, 13% travelled by car, 6% by bus, 2% bicycled (although 31% own bicycles), and did not travel very far since 73% worked or studied in the central city". 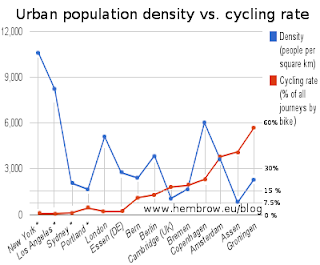 Note that even in the very centre of the city, and even with a demographic group which is the very easiest to attract to cycling, people are more likely to drive or to take public transport than to ride a bike. Hills are also not an issue in for city centre cyclists. 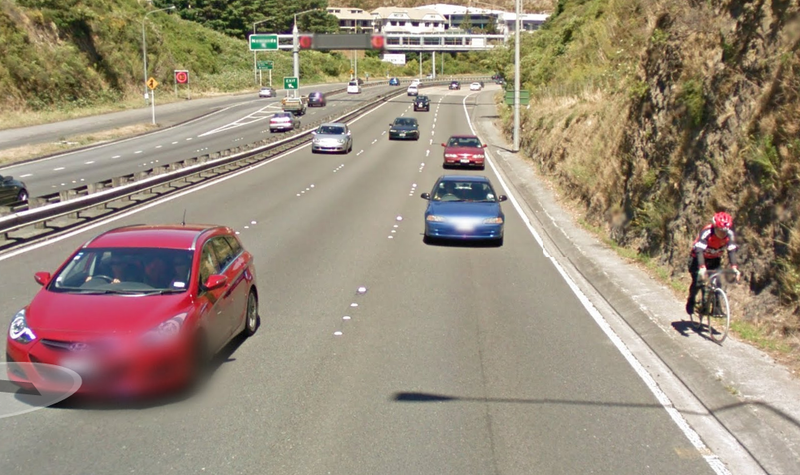 Indeed, the route out to the Hutt Valley is also quite flat, and where there were hills on the way to Porirua a reasonably flat route has been hewn out of rock for the motorway. Some of the suburbs of Wellington are hilly - comparable with those of Trondheim, where of course the weather is genuinely a challenge in winter yet the aim is to achieve 15% of journeys by bike by 2025. The population density of urban Wellington is slightly higher than that of Assen (890 vs. 780 people per square kilometre) while the metropolitan area density is very much higher than that of Trondheim (290 vs. 37 people per square kilometre). None of these popular justifications for a low cycling modal share would appear to apply to Wellington (nor to many other places) so what is real reason why so few people cycle in the city these days ? 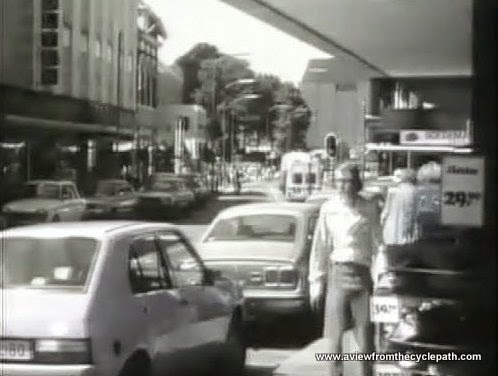 Here's my hypothesis about why it is that cycling is still so unpopular in and around Wellington: The city and the surrounding area are treating cycling no more seriously now than they were in 1971. The same could of course be applied to very many cities around the world. 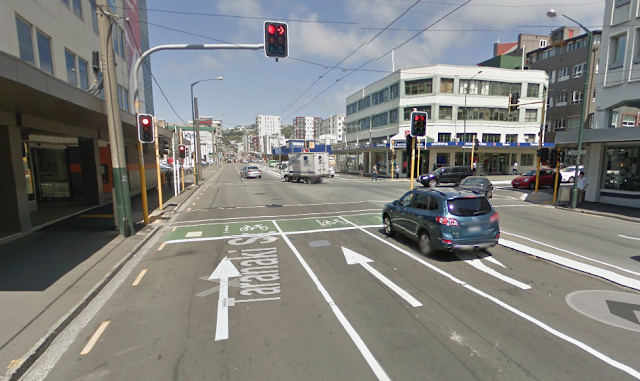 Here are some examples of Wellington cycling infrastructure. The absolute minimum has been done. Would you enjoy cycling in these locations ? Would you encourage your children or your partner, your parents or anyone else that you cared about to cycle in these conditions ? Near the city centre. Hills are not a problem, but look at the road. It's five lanes wide road with a three lane wide advanced stop box. Only the bravest of cyclists will be able to make use of this to turn right. On a commuting route: Five lanes for cars and trucks + a pavement for walking on, which you can also cycle on, but watch out for the parked (and parking) cars and the lamp-posts. Not an attractive environment for cycling. The distance from Lower Hutt to Wellington is less than 17 km. It's not at all unusual for Dutch school children to cycle up to 20 km to get to school. Would you want your children to cycle this route ? See it on Google Maps. Another commuting route: On the right, a cyclist. Fantastic brave human-being riding between a six lane motorway and rock face on a narrow strip of bumpy asphalt. Bigger view here. Another view, another brave person. Note that the path is not only narrow but it has posts on it which cyclists have to swerve around. This does not make for pleasant or safe cycling. 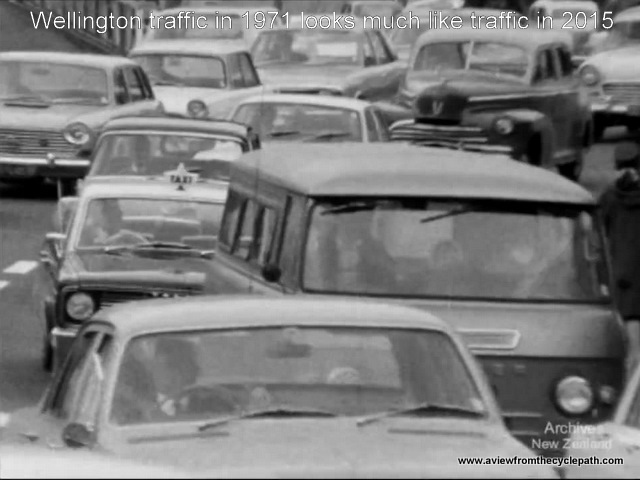 Many people have uploaded videos of traffic jams in Wellington to Youtube. No-one likes being stuck in a traffic jam, but when planners have concentrated only on driving and provided no real alternative for most people, it doesn't really matter how terrible the experience of driving becomes, people will still find driving to be their least terrible option and so they will still drive. Still from a video of a 13 km long commute by bike in Wellington. 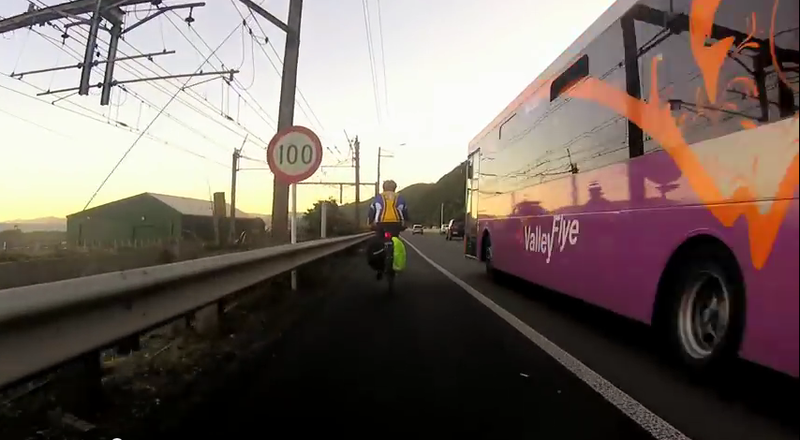 This is a shorter distance than many Dutch children cycle to get to school, but the video maker describes it as "intimidating even for confident bicyclists A 100 km/h multi-lane road with a painted stripe for cycling on the wrong side of the crash barrier is not nearly good enough to enable mass cycling. Please do watch this video and compare it with the conditions faced by drivers. By car it's slow and annoying, but it clearly doesn't feel so dangerous as cycling. 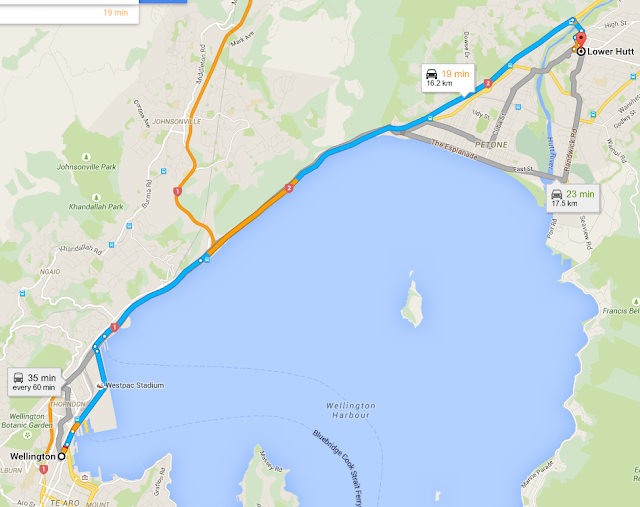 Google Maps suggestions for a similar journey, Wellington to Lower Hutt. Without a good alternative, people will continue to drive. I like cycling, but like the 29% of people who live in the centre of Wellington who own bikes but don't cycle, if I lived and worked in Wellington or a city like Wellington, then I might well drive instead of cycling. The infrastructure could not be better designed to make this happen. This blog post has concentrated on Wellington in New Zealand, but because the problems faced by Wellington are exactly the same as those faced by many other cities, the same applies to almost Anytown in almost Anycountry. Policy's just the same. Until a genuine choice is made to favour something other than the automobile, more and more dependency on motor vehicles is the only likely outcome. Cycling is a very fragile mode of transport. Cyclists are very obviously exposed to danger when they ride on busy roads or on inadequate paths next to roads, and this is why cycling is extremely sensitive to subjective safety issues. It's not realistic to expect that people will take to cycling in any appreciable numbers when the experience of cycling is akin to that of taking part in an extreme sport. Cycling was once popular in almost every country. Motor vehicle use rose not only due to cars being attractive in and of themselves, but also due to motoring being subsidized by government. This pushed cyclists aside both in plans and literally on the streets leaving those who still cycled in an increasingly precarious position. 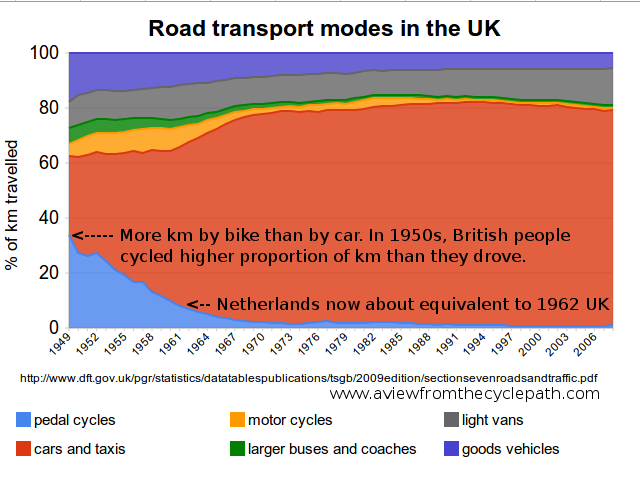 It took billions in investment and a lot of time for cycling to decline to the point it has reached now. For cycling to recover will also require considerable investment from government as well as time. There is no easily reached "tipping point" beyond which cycling will automatically increase. If such a thing existed then cycling would never have decreased past that point. In recent years, the Netherlands has led the world in cycling investment. Even here, the government has never spent more than a fraction of the amount on cycling that they spend on roads for cars, but this has been adequate to stem the flow of people away from cycling and to lead to a modest increase, In the Netherlands, the majority of trips and the vast majority of kilometres travelled are by motor vehicle. It would take a lot more than the Dutch have done to change that. However, at least in the Netherlands cycling has been made both accessible to everyone and very safe. No helmets required. Cycle-helmet zealotry in New Zealand has no doubt done harm to cycling by making an already unpopular activity even less attractive. Much of the damage had already been done, in that cycling was already at a low ebb. However, helmets will make it more difficult even to grow cycling again and for that reason I oppose the mandatory wearing of helmets. 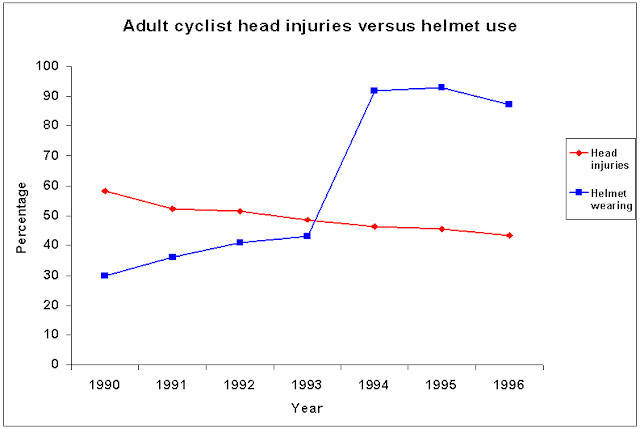 In any case, any emphasis on helmets is in the wrong place. Successful campaigns to improve safety, especially of children, do not rely on secondary devices such as helmets to mitigate the results of crashes, but remove the source of danger so that crashes do not occur. A grid of high quality go-everywhere cycle-paths is what keeps these children safe, not helmets. If New Zealand had done the same thing then Aaron Oaten's crash and resultant injury would almost certainly never have happened. Preventing collisions is far more effective than allowing them to occur and trying to prevent the worst injuries with safety equipment. Effect of New Zealand bicycle helmet law. ""Of particular concern are children and adolescents who have experienced the greatest increase in the risk of cycling injuries despite a substantial decline in the amount of cycling over the past two decades"
Effect of Dutch policy to make roads safer and build cycle-paths, especially concentrating on child safety. Between 1972 and 2013, fatalities on the roads dropped dramatically. Child road fatalities dropped by 98%. The successful road safety policy removed the danger from where vulnerable people were. This led to a huge reduction in the number of people either injured or killed. The absolute number of child fatalities dropped by 98% over a period of time when the population size and the proportion of trips made by bicycle both rose significantly. On-road cycle-lane approaching a pinch-point. A potentially dangerous situation for cyclists. Note how from this view the driving lanes appears to narrow at the pinch-point. Pinch points are often installed on roads to slow motor vehicles and to provide crossing places for pedestrians. They are often dangerous for cyclists. Road lanes which suddenly narrowed to encourage drivers to slow down can force them to come too close to cyclists resulting in close and dangerous overtaking or even a collision. However pinch-points do not have to be built in this way. In this blog post I illustrate a "pinch point" which doesn't really pinch at all. While the pinch-point appears from a distance to restrict the space for cars, resulting in drivers slowing down at the junction, the driving lane actually widens through the pinch point. The cycle-lane has constant width. Thorbeckelaan has a 50 km/h speed limit. These photos were both taken while riding along the road from west to east. Before the pinch-point. The driving lane is 2.8 metres wide, the cycle-lane 2.1 m wide. Note reasonably wide parking bays and a 0.5 m wide drain. The width of the drain helps to reduce dooring incidents (explained here), as does this being relatively infrequently moving residential parking and not business parking. 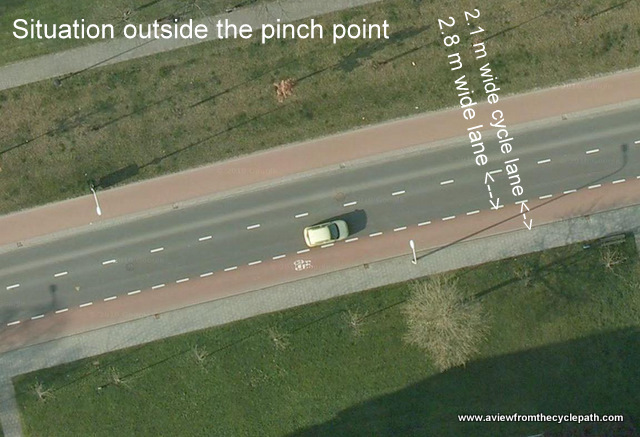 At the pinch-point, the cycle-lane remains the same width while the driving lane increases to 3.5 m in width. This still causes drivers to slow down. The narrowing of the driving lane back to 2.8 metres is visible after the central reservation. At this point there is of course no space for car parking. This blog post highlights a good example of how a pinch-point can be built which successfully reserves space for pedestrians crossing the road and also slows drivers, without squeezing cyclists. It's certainly an improvement over other pinch-points I've seen where cyclists are squeezed by drivers as they pass through pinch-points. However I don't mean to suggest that this road layout, with an on-road cycle-lane, is actually particularly good. Such infrastructure shouldn't be an aspiration. There are few destinations on this road so few clashes with drivers starting and stopping. Residential side streets do not provide through routes by car and therefore few cars turn into or out of the side roads. There are no bus-stops along this road. The cycle-lane is of a good width, providing wiggle room. The parking along the road is for residents, so those cars rarely move and the drain provides a gap where there are parked cars, reducing the risk of dooring. Because of these factors, almost all motor traffic on this road travels all the way from one end to the other without stopping and there are few conflicts caused by drivers cutting across the cycle-lane. Note that both ends of this road have extremely safe junctions. At one end there is a very safe roundabout and the other has a very safe traffic light junction. Neither of those relatively large junctions have ever caused cyclist injury. In other locations the problems would be greater. That is the reason why this layout is by no means a substitute for proper cycle-paths. Though it is overall quite well designed, this road (when riding west to east) is still one of the least pleasant along which to cycle within Assen. In particular, being overtaken by a bus or truck while riding side by side in the cycle-lane is not especially pleasant. On the other side of the road there's a segregated cycle-path. This road is unusual in that while there is an on-road lane for cyclists heading from west to east, cyclists heading in the east-west direction are provided with a kerb separated cycle-path on the other side of the road. The cycle-path not only feels far safer but due to being 2.5 metres wide and having a 0.5 metre buffer, it provides more space for cyclists further from motor vehicles. On this side of the road, there is little or no discomfort due to being passed by a large vehicle. 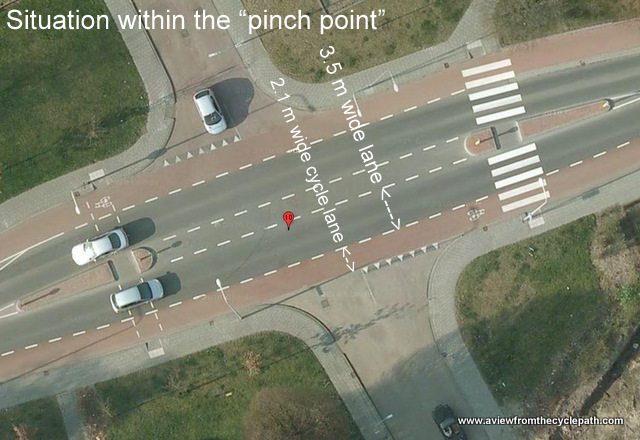 Note that with a proper separate cycle-path, pinch-points have no effect whatsoever on cyclists so can be made quite narrow in order to reduce the speed of motor vehicles. However on this road the driving lane widens on both sides through the pinch-point. Read about other examples of pinch points with cycle-paths and at village entrances. This junction doesn't have a good safety record. Why ? This road is a busy west-east route for both bicycles and motor vehicles. On its length there are three pinch points of a very similar design to that emphasized here. Two of these pinch points have a good safety record while this one has a relatively bad record by the standards of Assen. Why ? The reason is that this pinch point also happens to be a junction with a busy main cycle-route north-south which provides access from some suburban areas in the North to the city centre. The red flag with "10" within it on the second aerial photograph tell us that this junction has seen ten incidents since 2007, four of which caused injuries to cyclists, one of which injured a moped rider and one of which caused the unfortunate death in 2009 of a 76 year old female moped rider, in collision with a large car. each participant in this scene know what the others are doing? The most common recorded cause of crashes at this location is "no priority given". This suggests that people find it difficult to see each other well while maneuvering or find it difficult to judge whether they have time to complete a maneuvre. Turning across traffic from an on-road cycle-lane is always difficult because the cyclist's proximity to the driving lane results in having limited rear visibility. 180 degree head swiveling is required to see behind, which complicates control of the bicycle and makes correct decisions more difficult to make. The lack of gap between the cycle infrastructure and road also makes it more difficult for drivers to predict cyclist behaviour. Could you tell at a glance what everyone in the photo beside this paragraph was about to do ? It has been known for many years that unsignalled crossings are far more dangerous than either well designed roundabouts or well designed traffic light junctions. 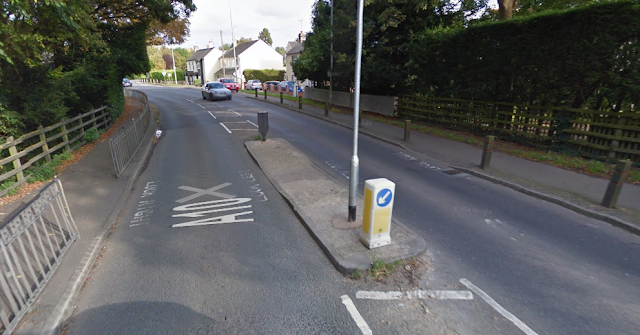 Therefore it should not be surprising to us that the well designed junctions at both ends of this road (both of which are illustrated at the links in the previous sentence) have a far better safety record than this relatively minor junction half way along this road. Due to the designed higher speed of this road (speed limit 50 km/h), the heavier traffic at this location and limited sight-lines compared with motor vehicle speed, this is not a suitable location for a cycle priority crossing like those which I looked at a few weeks ago. Don't copy this: Several narrow pinch points exist on the narrow but busy trunk road which passes through Harston in Cambridgeshire. Cyclists have no good alternative to using this road. Drivers habitually exceed the speed limit here, especially at the ends of the village where the speed limit drops sharply from 60 mph to 30 mph. I estimate the width of the road through this pinch point to be around 3 m. No additional space is provided for cycling. Note also dangerous steel railings which cyclists can be pushed against and that the paint pattern used in the middle of the road through almost the entire village also encourages drivers to give as little space as possible when overtaking cyclists. Both of the examples of pinch-points above increase danger to cyclists. They reserve no separate space for cyclists at all and they encourage bad overtaking behaviour by drivers, especially those who misjudge the speed of a cyclist and believe they have more time to overtake than in actually the case. Copy this only with caution: This is a residential street in Assen which has a relatively minor speeding and through traffic problem. These planters create a different type of pinch-point, potentially causing conflict between cyclists and drivers heading in both directions. Even when the same idea is used with a cycle bypass there is still potential for danger. Just because something exists in the Netherlands, that doesn't mean it's a good example. Context is always important and ideas which may work well enough in one street in the Netherlands cannot necessarily be translated to a different place and work well there too. Older examples like this are perhaps more understandably sometimes of poor design, but there are also examples of less well thought through brand new infrastructure which work poorly. I predict that some peoples' response will be there is not enough space in a given location for a safe pinch point to be built. This may be true for some locations, but if it is true then I would contend that before considering building a dangerous design of pinch point you should think very carefully about whether any pinch point at all is appropriate in that location. Other ways of removing conflict are possible. For instance, moving motor vehicles onto completely different routes. This has resulted in many minor streets and roads in the Netherlands working extremely well for cyclists and pedestrians without the need for pinch points or other obvious physical infrastructure. We offer the only independent study tours of Dutch cycling infrastructure with a native English speaking guide to minimise the chance of "lost in translation" errors. On our study tours we take care to demonstrate not only many good examples of good infrastructure but also explain why the less good examples should not be emulated.